Can I marry Jake Gyllenhaal already? He has proven himself to be one of the most versatile actors of his generation, and possibly ever. I'm beginning to think he can do it all, like the great Meryl. His tranformation to boxer Billy "The Great" Hope is seamless. It's not only a physical transformation, but the raw, dark place that he goes is both frightening and one we can empathize with. Watching this movie reminded me of another boxing movie fave - "Raging Bull" - though this film is in color, and we see enough bloody fight scenes to last a lifetime. "Southpaw" is a fantastic film, one of the best I've seen all year. I didn't know much about the plot of this movie going in. I'll be honest, I kind of just wanted to see jacked Jake. That, and I love Rachel McAdams and 50. I won't reveal much of the plot, as I didn't see the twists coming. 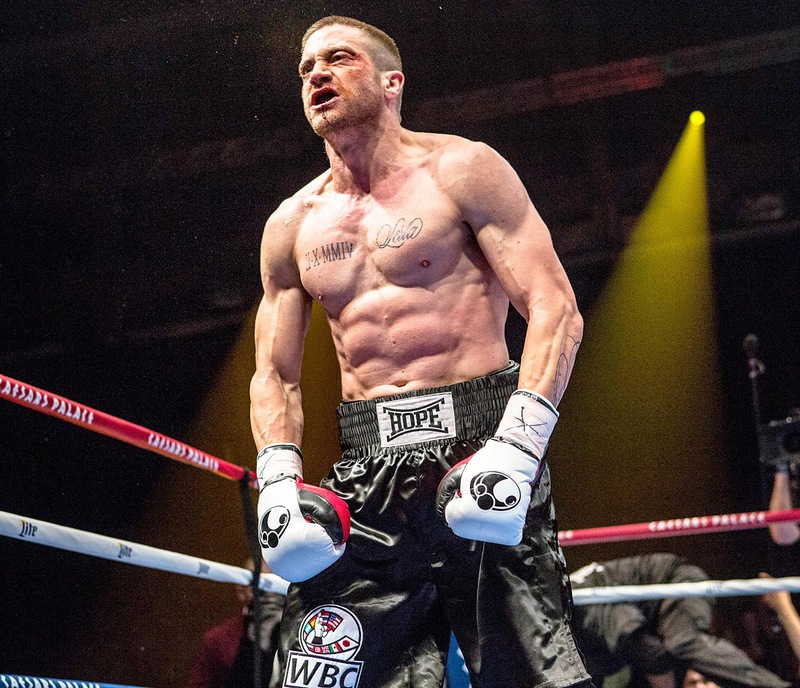 Gyllenhaal stars as an undefeated champion boxer who lives a lavish lifestyle with his wife Maureen (McAdams) and adorable daughter Leila (Oona Laurence). The chemistry between McAdams and Gyllenhaal bubbles over. She is so effortlessly talented and beautiful. And major kudos to child star Oona, who had some pretty emotional scenes. It's ironic that 50 Cent comes to Billy's rescue when he faces bankruptcy, as 50 has just declared bankruptcy in real life himself. Billy's problems seem to go from bad to worse. One night of seemingly bad luck spirals into self-destruction. It's not until Billy meets trainer and former boxer Tick Wills (Whitaker), when he is able to get back on the right track. Whitaker's performance is so natural. His presence on-screen is almost calming, and this is perfect casting for him. He is tough on Billy, but feels his pain. I would have liked more backstory on his character. The climactic fight between Billy and rival boxer Miguel Escobar (Miguel Gomez) leaves you sitting erect in your seat, sucking in breaths with every slow-motion punch. Your pulse will race. You'll also get teary-eyed a number of times. This film is dedicated to the memory of composer James Horner, who did the score. (Fans of "Titanic," "Braveheart" and many more will remember his beautiful music!) Gyllenhaal has found his stride lately, and it would be foolish of the Academy to not recognize him during award show season next year. This may just be the best he's been yet.